Fooling the Foley is a radio parody on the art of sound for cinema by Joao Castro Pinto and Bernhard Loibner for Kunstradio-Radiokunst at the austrian public radio ORF. The live radio performance took place on December 16, 2012 at 11.05pm CET on the public austrian radio ORF – OE1. (Kunstradio archive page here). This is a short video documenting the live radio performance “Fooling the Foley” by Joao Castro Pinto and me. We did the piece for the radio show “Kunstradio-Radiokunst” and it was broadcast live at the Austrian public radio ORF on December 16, 2012. I think the video quite nicely conveys the idea of the performance: an electro-acoustic radio parody on the art of sound for cinema and the art of foley. Thanks to the Kunstradio crew for the nice video! Cinema was born with the invention of the moving picture, its narrative / interpretation was at its dawn determined, upon other premises, by two main factors: 1st: gestural enhanced dynamics within the representation (dramatic emphasis of the gestures / facial expressions, in order to clarify the distinct intensities of the plot and describe each character’s profile) 2nd: the insertion of long captions, permutated with the images, in order to report the remaining significant information of the movie to the audience (thus allowing a contextual ground for the interpretation of the different scenes and overall narrative). Music was also present in the first motion picture exhibitions, mostly in the form of piano music. A pianist would play during the screening of the movie, with the aim to synchronize the unfolding of the narrative’s events with a musical “alike” structure. The event that would dramatically change cinema’s history, dethroning the monopoly of the visuocentric paradigm, was the insertion of sound in the motion picture. Sound would take and expand most of the expressive roles of the mentioned characteristics from the first silent movies, rendering its aesthetical fruition more similar with everyday experience of reality. The expression of context could now be explicit due to the possibility of recording the soundscape (environmental sounds & the sounds of human interaction with objects), as the display of emotions, within the narrative, became clearer through the reproduction of actor’s dialogs. Jack Foley was a pioneer (late 1920’s) in the art of introducing sounds in the motion picture like: steps, clothing sounds, squeaky doors / windows sounds, railroad train sounds, etc…. These sounds were fabricated in the studio, synchronized with the image, in order to enhance the experience of the movie. From that time to nowadays, cinema has learned to value sight as much as audition, thus cinema has became a rich complex audiovisual experience, a compound of image, music, sound effects and ambiences (currently enhanced with immersive surround sound). FOOLING THE FOLEY – a radio parody on the art of sound for cinema, is a radio art piece that will present a parody on the Foley concept as it consists in a real time acousmatic sound performance of pre-recorded Foley sounds at the studios of ORF (digital signal processing will be used to transform some sounds beyond recognition) and of samples of distinct genres and epochs of the cinema history (drama, comedy, terror, sci-fi, western spaghetti, etc…). 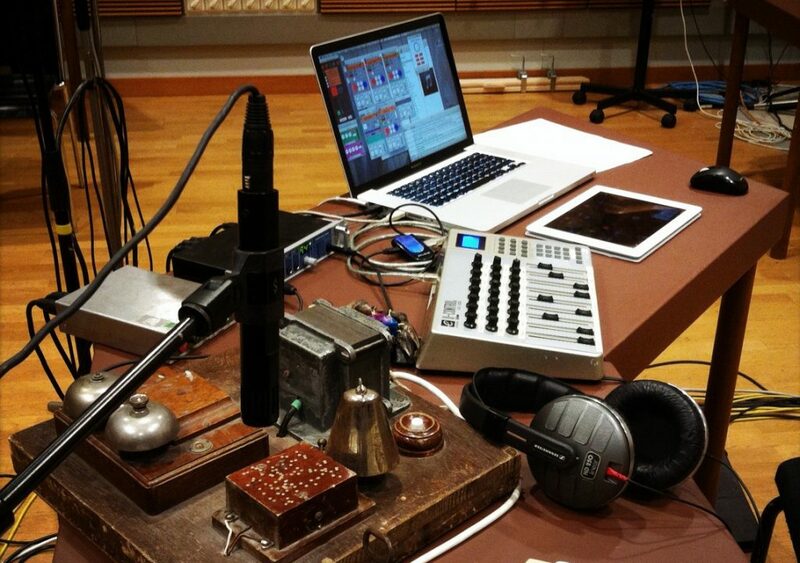 The main goal of the performance is to create a radio art piece where a feasible cinematic ambience is created, in terms of aural output, such as it will result in a rich and fascinating non linear sound-cinema-world narrative, where the distinction between prop Foley sounds and real time processed sounds will be blurred, distort and expanded through a collaborative acousmatic live sound composition. Images will flow as Sounds and Sounds will turn into Images.